Introduction: Neck infections, in the majority of the times, present as first aetiology the tonsillitis, followed by dental infections. However, other causes as oral procedures and oral trauma can be involved. Objective: To report two cases of cervical infection as complication of adenotonsillectomy, as well as their treatment and evolution. Report of Case: Case 1 - Male, 6 year-old, with evolution in the postoperative with neck infection and dispnea. He was interned in ICU and submitted to clinical treatment, presenting resolution of the symptoms. Case 2 - Male, 2 year-old, in 9th PO, developed fever, edema in left submandibular area, painful, and local hiperemia. It was initiated clinical treatment with ampiciline/sulbactam. In the 3rd day of treatment, as the patient did not present improvement, neck exploration was performed, having been drained small amount of purulent secretion. We opted for the substitution of the antibiotic for ceftriaxone and clindamicine, with resolution of the symptoms. Conclusions: The importance of a meticulous preoperative exam is pointed out in the adenotonsillectomy, including history of infection of superior airways, presence of active infection, fever and age, due to the correlation of infections and risk of breathing compromising. During the operative act, one should observe the amount of bleeding, because it can be a sign of possible complication. Once detected the postoperative cervical infection, it is recommended to begin the fastest possible the appropriate treatment, favoring a good evolution. Adenotonsillectomy has still been the most frequent surgical procedure in ENT area. Surgery has been going through changes in order to become simpler and to reduce complications(1), such as hemorrhage, pain, fever, sickness, nausea, otalgia, cough, headache, odinophagy and others(2). Neck infection during post-operative (PO) period is rare and its description in the literature lacks. The target of this study is to present two cases of patients who developed adenotonsillectomy with neck infection and breathing difficulty in the PO. A 6-year-old-male patient was submitted to adenotonsillectomy. At the first PO he presented anterior neck pain, fever, dyspnea and dysphagia. At the 2nd PO he developed neck oedema to the right, followed by phlogistic signs (Picture 1A). 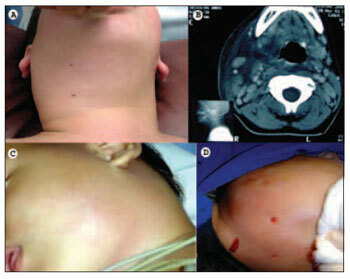 Case 2: pictures (C) displaying bulging on left submandibular area and local hyperemia and (D) after drainage of small amount of local purulent secretion. He presented infective blood count; cervical radiology showed a diffuse increase of the soft areas in the neck, trachea with reduced diameter and increased retropharyngeal space. CT exam showed oedema of the soft cervicofacial areas to the right, from the parotidea area to the supraclavicular one, deviating air passages to the left (Picture 1B). Several punctures were carried out in the right neck area, with no secretion. Therapy started with ampicillin/sulbactam usage, and then there were clinical and laboratorial improvements. Patient was released at the 6th PO with no symptoms. A 2-year-old-male patient, at the 9th PO developed adenotonsillectomy and presented fever, left submandibular area bulging, pain and local hyperemia (Picture 1C). He was sent back to hospital and started therapy with ampicillin/sulbactam. On the 3rd day in hospital, as he did not present any improvement, he was submitted to a cervical surgery exploration, and a small amount of purulent secretion was drained (Picture 1D). Antibiotics were replaced by ceftriaxone and clindamicine, and he was released from hospital on the 13th day, under amoxicillin-clavulanate medication with no fever or symptoms. The high frequency how adenotonsillectomy surgery is performed in the ENT area requires a good knowledge of its possible intercurrences and complications in order to treat them in a correct and safe way. Air passage obstruction, dehydration and hemorrhage are life threatening complication. Hemorrhages are more common, occurring between 1.1% and 7% of the cases(3). Nowadays, tonsillitis is the most common origin of the deep spaces infections, followed by odontogenic origin. Therefore, around 20% to 50% of deep infection causes in the neck have not been identified(1). Different microorganisms can be present in cultures of surface and tonsil fossa. In a certain study, 25% of bacteremia in blood samples from patients at the immediate PO of tonsillectomy(4). Regarding fever that occurs in the first 24 hours after such surgery, its origin is obscure, but it does not seem to an infection cause(5). Deep infection in the neck therapy implies the use of corticosteroid and intravenous antibiotics, such as clindamicine, ampicillin/sulbactam and cefuroxime. The association of surgical and clinical therapy or only clinical therapy is questionable. Some professionals prefer surgery for cases in which there were no responses in 48 hours. Removal and drainage can be performed (when there is secretion) or even aspiration with good PO results(6). It is important a detailed pre-operative exam for adenotonsillectomy surgery, including infection history of superior air passages, presence of active infection, fever and age, due to the correlation of infections and breathing involvement risks. Suring surgery, the blood amount should be observed for being a sign of complication. Once PO cervical infection is noticed, it is recommended to start proper therapy as soon as possible favouring a good improvement of symptoms. 1. Johnson LB; Elluru RG; Myer CM. Complications of adenotonsillectomy. Laryngoscope 2002; 112(8Pt2) Supl. suppl 100 pags.35-6. 2. Salomen A; Kokki H; Nuutinen J. Recovery after tonsillectomy in adults: a three-week follow-up study. Laryngoscope 2002; 112(1) pags. 94-8. This article was submitted to SGP (Sistema de Gestão de Publicações - Publication Management system) of R@IO on October 25th, 2007 and approved on November 14th, 2007 at 12:51:49.